I am doing a presentation for Women's Studies on Sojourner Truth. I haven't had as much interest in researching than I am now. I love learning about Sojourner Truth. She is a very interesting and amazing person. I am glad I had chosen to do a presentation on her! Sojourner trust is a hero! She stood up and faught for women slavery, yet nobody bothers to remember he name! I started researching he when i was mearally eight years old. I am now thirteen and am still inturested by this womans story!I remember that in fourth grade i said i was still into Sojourner, and many people in my class said "Who the heck is Sojourner Truth?" it amazes me how all the world has been affected by her decisions and her courage, and yet i havn't seen anybody do anything about it! i am ashamed by our counrties rudeness and am astonished by how we have respected her contributions to our freedom! 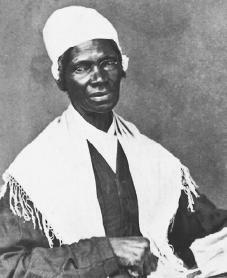 WHO REPRESENTED SOJOURNER TRUTH IN 1828 LAW SUIT? She sued a slave owner in Alabama to get her son Peter returned to New York! Please provide all the details of the case and names.